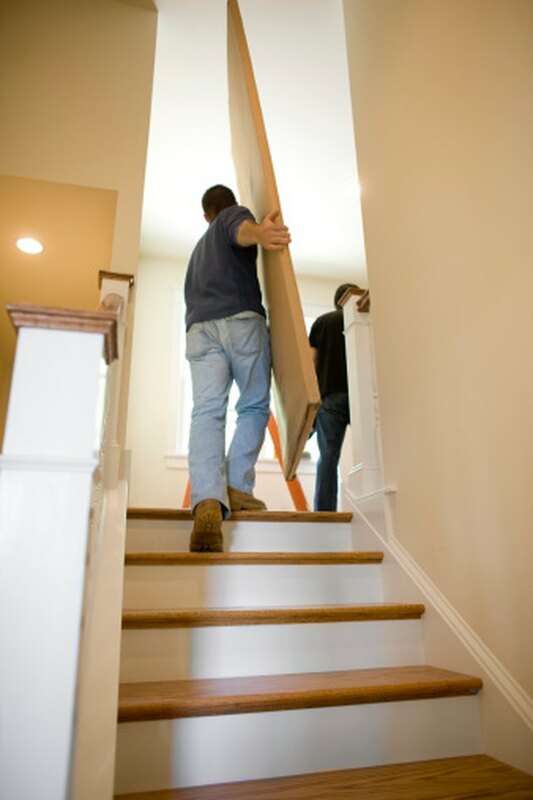 According to California Women, Infants and Children Association, one flight of stairs averages 10 steps with a variable of the number of steps on the landings between floors. The number of calories burned climbing 90 steps plus the landing will depend on your how much you weigh and how fast you climb the stairs. Running up the stairs or carrying weight will burn significantly more calories. A 130-lb. person burns 885 calories per hour running up stairs. Assuming it takes two minutes to run up nine flights of stairs, that person burns approximately 29.5 calories to reach the top, according to NutriStrategy website. A 180-lb. person burns 40.8 calories running up nine floors of stairs in two minutes. A 130-lb. person walking up the stairs and carrying 16 to 24 lbs. burns 23.6 calories in four minutes, lists NutriStrategy. A 180-lb. person climbing nine flights of stairs in four minutes, carrying 16 to 24 lbs., will burn 32.6 calories. While the upward climb burns more calories, walking downstairs will also work off some calories. NutriStrategy says a 130-lb. person burns nine calories in three minutes walking down stairs. A 180-lb. person burns 12 calories walking down nine floors of stairs in three minutes.